Do you have more than one Active Directory forest and want to exchange information in your Exchange Global Address List? GALsync will share Exchange mail-enabled objects such as distribution lists, address books and calendar free-busy information between AD forests. Your company has one internal Active Directory and one separate Active Directory for company’s sales representatives. You want all user objects and groups of the sales reps AD to be visible to your internal Outlook/Exchange users (using the Global Address List). Vice versa: You want all sales reps have access to information of a subset of the internal users. Because of a company takeover you have to integrate different Active Directories and Exchange organizations. You have to share all or subsets of all user and group information for Outlook/Exchange users in the Global Address List. Do you need to view a GAL from another company? 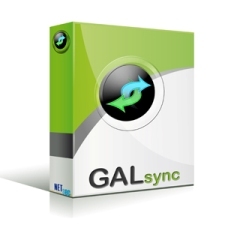 GALsync quickly and easily enables your organization to sync free busy information between Exchange 2003, 2007 and 2010, 2013 and Office365 organizations. You can select all objects or subsets of objects to export to the other AD. While GALsync is used for Outlook/Exchange it will only consider mail-enabled objects. Additionally you can exclude objects by using an configurable phrase in a configurable custom attribute. GALsync is cross-domain capable. Simply select objects in any of the domains in your forest to export. Data is transmitted encrypted between the different Active Directories, So nobody can read your object’s details during the transmission from source to target. While Exporting your information you create a secure key which has to be sent separately to the administrator of the other side. Only with this secure key he may import the data. GALsync is written in managed code using .NET framework 2.0. It may run on 32 or 64bit Windows platforms. Log files are created so you can track exactly what happens. If you want the warnings and error messages also to be written to the application log you may configure this as well as different protocol and severity levels. Export information from your forest by selecting objects and their attributes. Import information from another forest and publish them in your Global address list (GAL). Transmit data in a secure manner. Configure an export and import schedule. Reduce time and failures caused by sharing information manually.